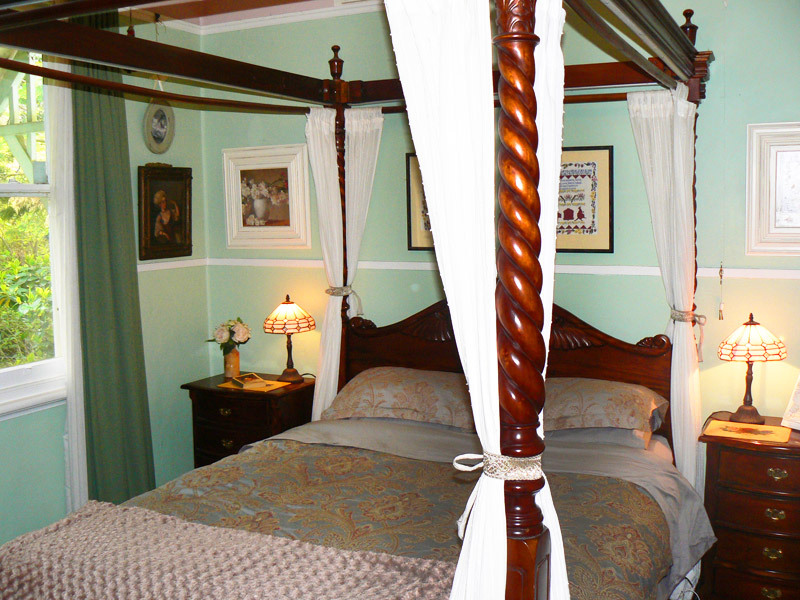 The master bedroom features a luxurious queen size 4 poster bed with top quality sheets and bed covers. For those chilly winter nights switch on the electric blankets. Morning or night it provides a retreat from which it is difficult to leave. The second bedroom is light and airy, featuring heritage colours, an antique geisha dressing chest, a classic 19th century wardrobe, quilt made from antique Japanese silk. 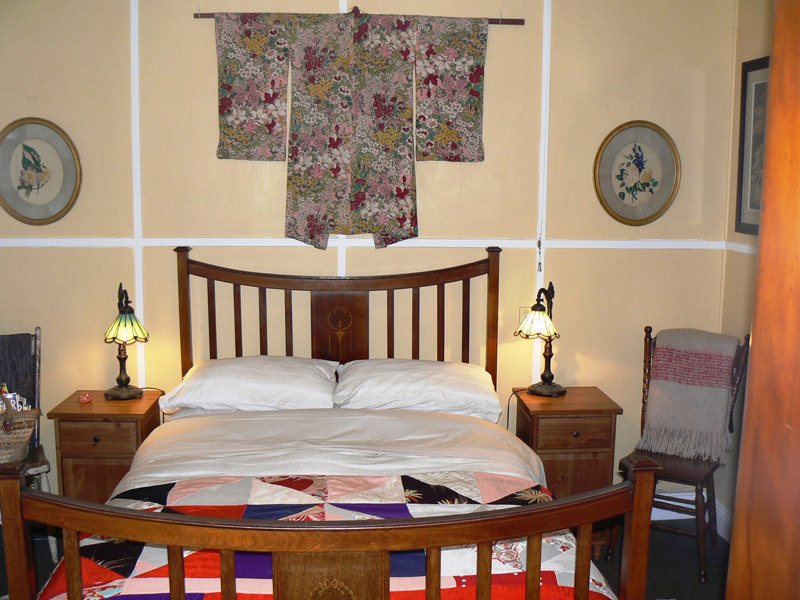 An antique Kimono is a feature on the wall behind the timber framed double bed, which gives a comfortable nights sleep in rich surroundings. Please click on images to enlarge. 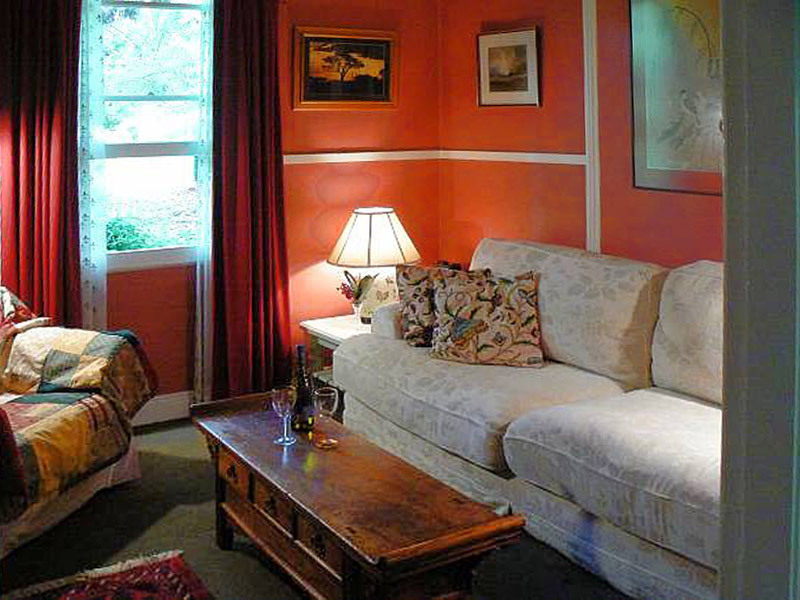 In the living room you will find yourself instantly fathoms deep in colour and warmth. Suffused with candle and firelight it is a haven at night. A perfect place to relax and enjoy a glass of fine wine. There is a gas log fire, plush sofa and chair, library, T.V., DVD player with large selection of movies as well as a stereo system with a large selection of CDs. Music can be switched through to the speakers in the bathroom. Please click on images to enlarge. 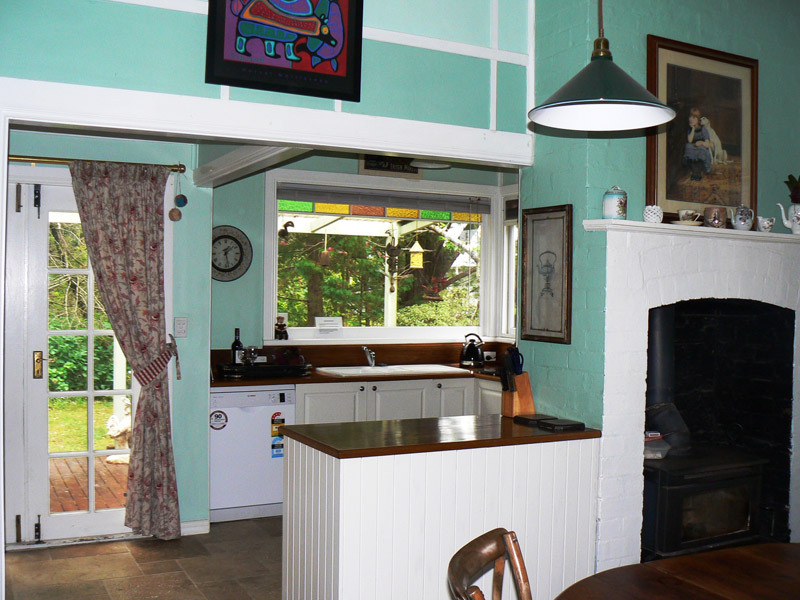 Fully equipped kitchen with quality appliances which includes stove, fridge, microwave, dishwasher and washing machine. The floor is travertine marble laid out in a French farmhouse style. Welcome breakfast provisions are provided upon your arrival. This includes bread, butter, biscuits, eggs, ground coffee, teas, milk, jam, marmalade, and cereals. The kitchen opens up to a cosy dining room with a combustion wood fire and externally to a large deck overlooking a secret garden with many original stone sculptures. With candles and gentle downlighting it creates a perfect place for a romantic dinner for two. Alternatively there are many fine restaurants only a stroll away from Lemon Tree. Please click on images to enlarge. The modern bathroom is fitted with a luxury, double side-by-side spa. A natural gas hot water system ensures endless piping hot water. 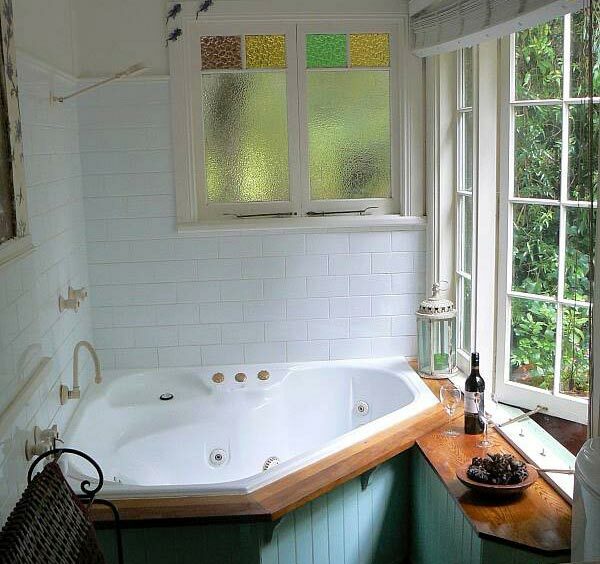 The french windows give a private view to the leafy garden from the spa. Guests have no need to lower the blinds whilst engaged in the exhausting pastime of luxuriating in the bubbles and watching the birdlife. 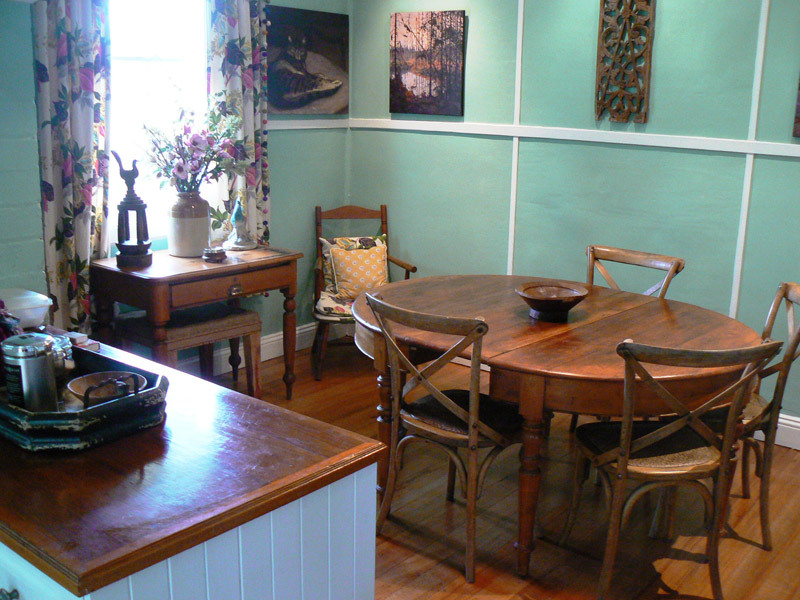 To the rear of the cottage, French doors open on to a private north-facing decking (a perfect little suntrap). A teak outdoor setting and period bench provide an idyllic and restful place to enjoy the tranquility of the garden. 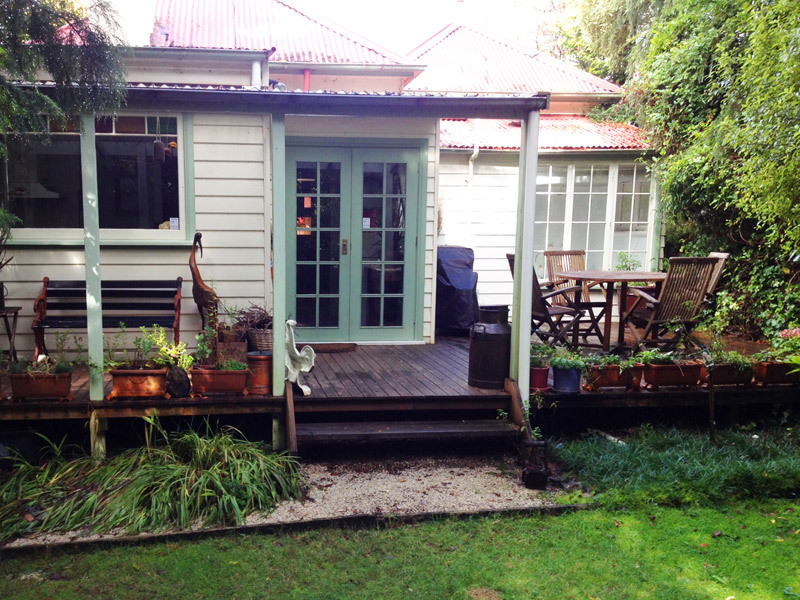 A gas barbecue with two cylinders (to ensure that you never run out of gas) may inspire you to take a break from Leura's restaurants and to dine 'al fresco'. 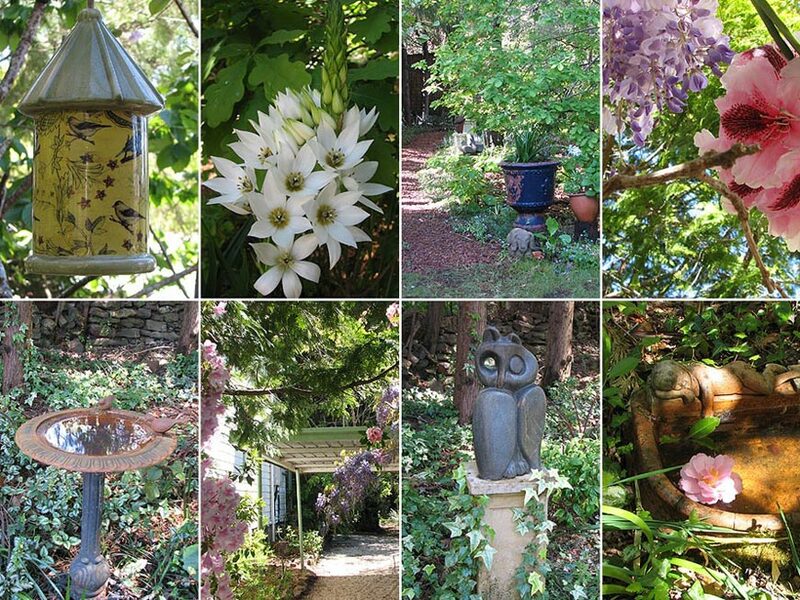 A feature of the cottage is a unique sculpture garden which can be viewed from the rear deck. The beautiful individually carved stone, wire and wooden sculptures are mounted on strategically placed plinths which allow for visual enjoyment from the cottage back deck. Please click on images to enlarge.